A deliciously festive dish that will make you want more and more. Break open the cardamom pods and either bash the seeds in a pestle and mortar or blitz until fine in a spice grinder. In a small bowl, whisk together half the ground cardamom with 3 tablespoons of the maple syrup, the juice of half the orange and half the vanilla seeds. Cut the pears in half lengthways and remove the cores using the tip of a teaspoon. Lay the pears in a snug layer in a small ovenproof dish, cut side up, and drizzle with the maple syrup mixture. Add the scraped-out vanilla pod to the dish too. 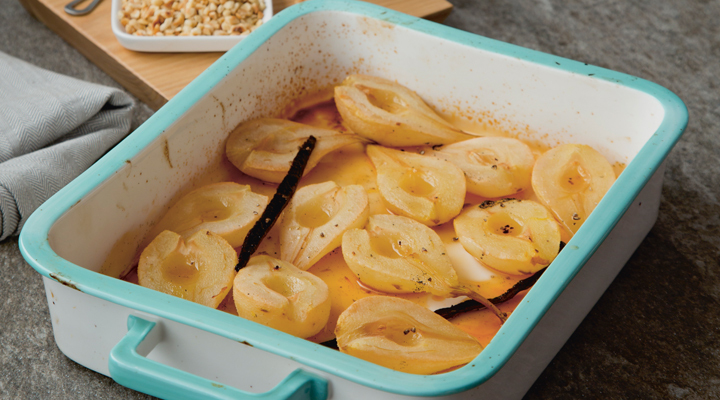 Bake in the oven for 30 minutes, until the pears are tender and releasing their juices. While the pears are baking, put the hazelnuts on another tray and roast in the oven for 8 to 10 minutes, until their skins are starting to come loose and they’re beginning to turn golden. Tip into a clean tea towel and wrap up so that none of the hazelnuts can escape. Bash on a counter to loosen the skins, then pick out the ones that are peeled and set aside. Repeat the process until they are all peeled, then roughly chop. When the pears are almost baked, combine the mascarpone with the orange zest and the remaining juice, ground cardamom and vanilla seeds and the last tablespoon of maple syrup. Mix until smooth. Serve the pears warm in bowls topped with a dollop of cardamom mascarpone and some crushed hazelnuts. Decorate with fresh mint leaves if liked.